A government-financed Russian media outlet's recent report does its best to tie Modern Warfare 2 to a tragic airport bombing. Moscow's Domodedovo Airport was hit by a deadly suicide bombing attack this week that killed dozens of people and injured nearly 200 more. Shortly afterward, government-financed media outlet Russia Today put together a report that questioned if games like Modern Warfare 2 were to blame. 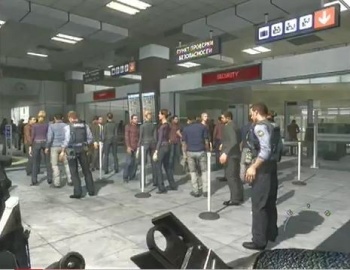 Modern Warfare 2 made waves in 2009 when its controversial opening scene was revealed to put players in the shoes of a Russian terrorist group that attacks civilians in an airport. Russia Today's report doesn't outright blame Modern Warfare 2 for the Domodedovo attack, but it uses quotes and edits that clearly indicate what the outlet was going for. A Russia Today reporter first takes a look at the "No Russian" scene from the "American-made" Modern Warfare 2, goes over the game's billion-dollar popularity with millions of people worldwide, and finishes the thought by tying the virtual scenario to reality. With all of the people "downloading, playing, and watching" Modern Warfare 2, the report suggests that terrorists could be training on these types of games too. Walid Phares, a "global terrorism expert," is seen in the report saying: "It's a trouble to look at the game and then the reality. We need to know if terrorists or extremists are using these videos or these dvds or these games to basically apply the model ... I think those that have been radicalized already - Jihadists, al-Qaeda, or other kinds - they look at the games and see that these games will serve them to train." It's not obvious if Phares' quotes were taken out of context or not, but to me they seem abruptly cut to imply the point that Russia Today wanted for the report. Russia Today also wonders why there hasn't been more criticism of the game in light of the Domodedovo attack. Plain and simple, the report is lazy journalism at its finest. I don't know how the management structure of Russia Today determines what's reported on (with that whole "government-funded" aspect), but it seems like somebody at the outlet wanted to cause more outrage over a terrible tragedy and maybe tie in a little xenophobia just for kicks. Admittedly, Modern Warfare's "No Russian" scene is very disturbing, but someday I hope the media will cover the world's ills without looking back to see if there's a videogame it can vaguely compare them to.